Bob Bafia had the potent bat on this April night, according to The Orlando Sentinel. But it didn't wake up until late in the game. Bafia, playing for the Huntsville Stars, broke up an Orlando no-hit bid by Pat Mahomes in the eighth inning. He then provided the power behind a Huntsville 8-run ninth inning with a bases loaded double to clear the bases. 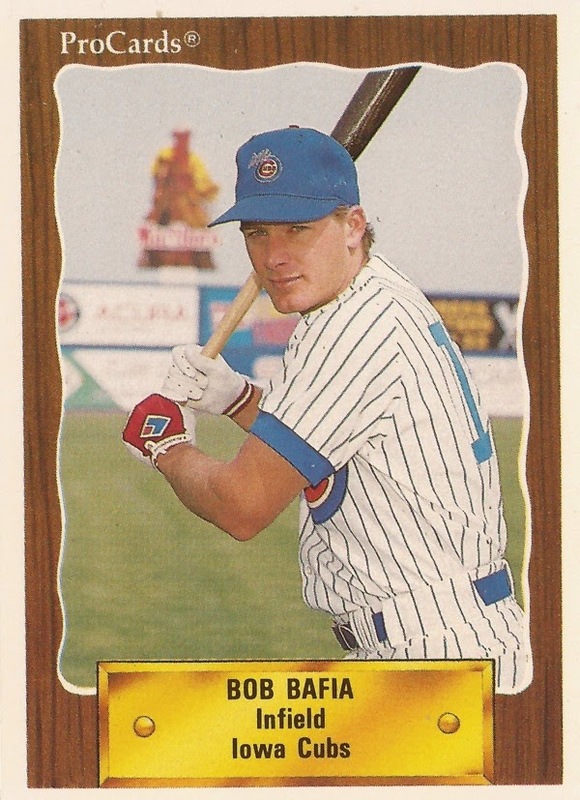 This was April 1991 and Bafia was in his seventh season of pro ball. But he would play in only 13 other games. This was Bafia's last season in a career that got him to AAA ball, but no higher. Bafia played in Huntsville that year after signing on with the Athletics. But much of his career was spent with the Cubs, taken by Chicago in the eighth round of the 1985 draft. Bafia worked his way up, starting at short-season Geneva that year, hitting .252 and seven home runs. After parts of three seasons at single-A Winston-Salem, Bafia made AA Pittsfield for 62 games in 1988, but he hit just .193. In August 1988, Bafia was involved in a strange play that didn't go as intended, but won the game anyway. Bafia popped it up, but opposing New Britain failed to realize the runner failed to tag up and didn't appeal and lost, according to Sports Illustrated. But he returned to AA in 1989, to Charlotte, where he hit .278 with 10 home runs. Three of those home runs came in an eight-game stretch in April. He led the team in that category going into May, according The Rock Hill Herald. "We can hit a little bit," Charlotte manager Jim Essian told The Herald after a June win. "We got some clutch hits and we took advantage of some walks early. Derrick May is really swinging the bat and Bob Bafia continues to come through." By mid-July, Bafia was in Iowa. But he hit just .226 with six home runs. He returned to Iowa for 1990, playing later in the year back at Charlotte. It was his final year with the Cubs system. For 1991, he was with the Athletics at AA Huntsville and he was done. Bafia also played in Mexico and Italy, according to his biography. He has since became an infield instructor with the San Diego Longhorns youth baseball team a job he continues in 2015.